There are lipo battery sizes ranging from tiny one cell packs for micro flyers to mulit-cell batteries for large scale electric powered planes and heli's. The voltage and capacity of any size battery pack depends on the capacity of each cell and how they are wired together. To understand how LiPo battery packs are sized, you need to have a basic understanding of voltage and capacity. If you're not that familiar with batteries, that's OK. Just think of voltage as the "muscle" and capacity as the "energy" of a battery. You know from our previous discussion of Lipo Battery Packs that every lipo battery cell has a nominal voltage of 3.7 volts. Just remember that the capacity of LiPo cells can vary, but the voltage of all LiPo cells is the same. To build voltage, cells are added together in series. The voltage (muscle) of the LiPo battery pack will continue to increase as more and more cells are added in series. But the capacity (energy) of the pack will NOT increase as cells are added in series. To build capacity, cells are added together in parallel. The capacity (energy) of the LiPo battery pack will continue to increase as more and more cells are added in parallel. But the voltage (muscle) will NOT increase as cells are added in parallel. 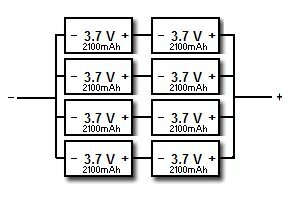 You can build a lithium polymer battery pack to meet the voltage and capacity requirements for any electric RC airplane by mixing a combination of cells in series and in parallel. The specification of each LiPo battery back can be represented by the standard xsyp naming scheme. The x represents the number of cells in series and the y represents the number of cells wired in parallel. The 4s2p battery pack illustrated above consists of two 4s packs in parallel. 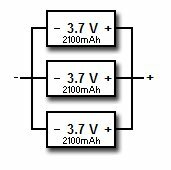 A 2s4p Lipo Battery packs consists of four 2s packs in parallel. Right Size Pack for YOUR Airplane? The KV rating defines how fast your motor will turn per volt of the battery. The more voltage your battery has, the faster the motor will spin. So choosing the voltage of the battery is directly related to sizing the propeller for your airplane. Changing the voltage is probably not something you really want to mess with too much. But you might want to experiment with different capacity batteries. The weight of a cell is directly proportional to the capacity. You may want to increase flight times by using a higher capacity battery. Or perhaps you want to sacrifice flight time for better performance from a lighter battery. But whatever you do, DO NOT EXCEED the C rating of the battery pack. This will drastically shorten the life of your battery and very well could catch your plane on fire. I strongly recommend that you purchase a current meter. Without one, you are pretty much blind as to what's going on with your motor. Current meters are fairly cheap and allow you to see exactly how much current your motor is drawing. You'd be amazed at how much the current draw of the motor can be affected by simply changing the pitch or diameter of your propeller. A current meter is definitely a must have gadget when determining the correct LiPo battery sizes for your set up.